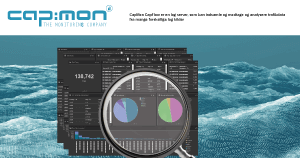 CapFlow is an add-on/standalone module based on open source products that are used to collect and analyse your traffic data. 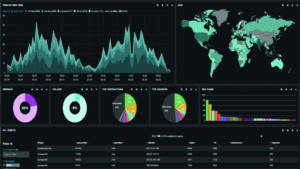 It is built around a log server that can collect and receive from many different log sources – also NetFlow and sFlow data. CapFlow analyses and reports what your bandwidth is being used for – which applications and by whom they are used. CapFlow uses CapMon features (for collection, filtering and presentation, etc. ), and is fully supported by CapMon. You will get a real-time view of the network traffic and be able to identify and eliminate network issues before they develop. All collected and analyzed NetFlow and sFlow data are presented in a usable format. CapFlow also helps you locate machines and devices that use too much bandwidth and find bottlenecks in the network, thereby improve the efficiency of the entire network. Capmon’s ”CapFlow” is based on Elastic modules. Elastic is used by thousands of organisations, among others Cisco, eBay, Goldman Sachs, NASA, Microsoft Wikipedia og Verizon, who use Elastic products to support mission critical systems.